Degausser.com | Your guide to degaussers and hard drive erasers. What is a Degausser? How Do Degaussers Work? As applied to magnetic media, such as video, audio, computer tape or hard drives, the movement of magnetic media through the degaussing field realigns the particles, resetting the magnetic field of the media to a near-zero state, in effect erasing all of the data previously written to the tape or hard drive. In many instances, degaussing resets the media to a like-new state so that it can be reused and recycled. In some instances, this simply wipes the media in preparation for safe and secure disposal. Retailers such as DataDevices International offer different types of degaussing equipment for different applications. Are There Different Types of Degaussers? 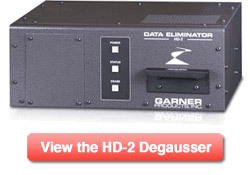 There are several degausser types available on the market today that each employ various technologies. These degausser unit types include coil, capacitive discharge and permanent magnet. A coil degausser employs a steel core wrapped in copper wire that creates an alternating electromagnetic field when activated. This magnetic field is always present when the degausser is powered up, which can overheat the coil. A disadvantage of this type of degausser technology is that it creates very high levels of heat, so these degaussers oftentimes have a short operational cycle, ranging anywhere from one minute to several minutes before requiring a longer cool-down period before they can be reused. 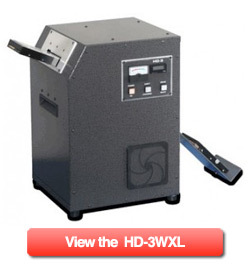 The AC degausser must have a limited duty cycle to protect the coil from overheating. Larger coil degaussing machines utilize fans to keep the coil as cool as possible and extend the operating cycle. Many hand-held degausser units as well as manual and conveyor machines employ the use of a coil. Permanent magnet degaussers can be run continuously, seven days a week, because there is no electrical component that can overheat. Depending on the size of the permanent magnet employed, a degausser of this type frequently offers a greater intensity of magnetic field. This permits extremely high gauss rating machines to erase new 6000 oersted perpendicular hard disk drives. There are several models of manual and drawer-style degaussers available that employ permanent magnet technology. When discussing degaussers, two terms are commonly used: Gauss and Oersted. A Gauss rating of a degausser is a mathematical value ascribed to the intensity of magnetic field generated by a particular degausser. The term was named for Johann Carl Friedrich Gauss (30 April, 1777 – 23 February, 1855), a German mathematician and scientist who was an early researcher in the field of magnetism. The Oersted rating (abbreviated as Oe) is a mathematical value ascribed to the magnetic field strength or intensity of an object, such as a unit of magnetic media (tape cartridge or hard drive). The term was named for Hans Christian Ørsted (14 August, 1777 – 9 March, 1851), a Danish physicist and chemist, best known for discovering that electric currents can create magnetic fields. Typically, the Gauss rating of a degausser should be at least twice the Oersted rating of the magnetic media to be erased. Can Computer Tape and Hard Drives be Reused After Degaussing? Many types of magnetic media can be reused after being run through a degausser, such as analog and digital video cartridges, DLT, 3480 and 3490. However, certain forms of media employ the use of servo tracks, which tell the computer how to interface with the media so that it can be read. Using a degausser to erase these not only erases the data on the media but also erases the servo tracks, so that the computer or tape drive will not be able to engage with the media after erasure. Hard disk drives and LTO and 3590 tape employ servo tracks and cannot be reused after being degaussed unless they are reformatted by the manufacturer and the servo tracks are rewritten. Why Is The Use Of A Degausser Important? Within the past several years, laws have been passed outlining stricter guidelines and greater penalties for data security, making it illegal for companies and organizations to carelessly or irresponsibly dispose of any critical or personal data. Such laws include the Health Insurance Portability and Accountability Act (HIPAA), Gramm-Leach-Bliley Act (GLBA), Fair and Accurate Credit Transactions Act (FACTA), Federal Information Security Management Act (FISMA), and the Sarbanes-Oxley Act. Companies can no longer simply throw away computer tape or hard drives because it is illegal to do so – not only because of the loss of critical data, but also because of environmental pollution. These new laws provide for greater monetary penalties and for stricter legal obligations. Using a properly-rated degausser has become an absolute requirement. In today’s increasingly litigious world, the use of a degausser provides a safe and effective means of magnetic media data security for individuals, organizations, corporations and government agencies.